Helena Killeen, my great grandmother came from a large family of 10 children. 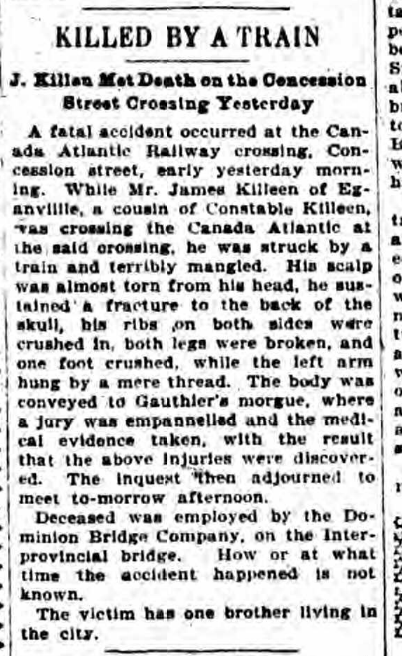 The question of what happened to her brother James was only magnified by his death certificate which seems to read “killed by trains.” The 1900 death rolls provide only that very small amount of information as to how he died in Ottawa on 17 October 1900, at age 32. He was buried from St. Ann’s in Sebastopol, in the Renfrew area, but the records there do not indicate what happened. The new microfilms of the Ottawa Journal now online through ancestry.ca were one way to try to find something out. A short report headlined “Killed by Train” told the story of the discovery of his body at the Canadian Atlantic Railway yard. 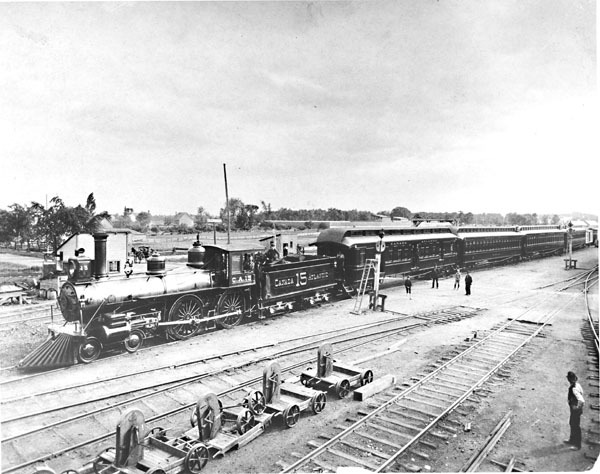 Interestingly, it suggested he had been hit while using the crossing… and a short article — elsewhere on the same page — headlined “The Killeen Accident” offered the railway’s version: he was found 300 yards from the crossing and must have been on their right of way, not using the crossing, at the time of his death. James had been working for Dominion Bridge Company, which was building the interprovincial bridge. He was apparently living in Eganville and working in Ottawa, possibly staying with a brother in the city. Could he have been coming back by train and fallen off? .. or was he sleeping by the trains waiting for an early morning trip back home to Eganville? We know a little more about what happened to him, but still more to find out.